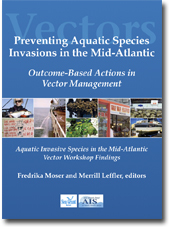 The Mid-Atlantic Vector Workshop Report identifies outcome-based actions for vector management to minimize or eliminate new bioinvasions. Two major vectors were maritime shipping (ballast water discharges and ship fouling) and live trade (bait, aquarium species, aquaculture, live seafood and aquatic plants). Although there are some regulations, policies, education, outreach efforts, and public engagement efforts in place, many knowledge gaps and directed actions need to be addressed to improve vector management. 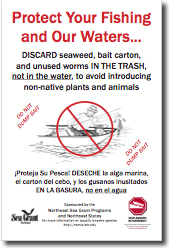 The "Do Not Dump Bait" poster alerts the public to the dangers of discarding seaweed, worms and other materials into the water that can cause inadvertent introductions of non-native plants and animals. The poster is sponsored by the Northeast Sea Grant Programs and Northeast States. 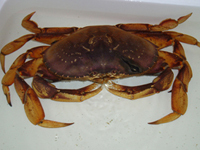 Dungeness crabs (Cancer magister) are native to the US Pacific Coast, but two were caught in Massachusetts Bay. This red alga (Grateloupia turuturu) grows in the shallow sub tidal areas and threatens native algal species, some of which have commercial value. The sea squirt (Styela clava) originally from the Pacific Ocean is established in New England and serves as a surface for other encrusting sea squirts and bryozoans. Marine introduced species are live marine plants and animals that have made their way to non-native waters by way of ship hull fouling, ballast water release, live fish releases and other pathways. Some non-native species may be introduced deliberately, for example, for aquaculture or accidentally, e.g., as hitchhikers or stowaways. When introduced species cause economic damage, severely impact ecosystems, or cause harm to human health, we call these species invasive. Some common examples of invasive marine species are shipworms and non-native crabs. Shipworms (boring animals) damage piers in harbors and ports with a cost of $250 million a year in the U.S. alone. Introduced crabs feed on shellfish and native species costing the aquaculture industry tens of millions of dollars each year. Introduced species are an international problem. There are extensive campaigns around the world to control invasive species and the damage that they cause. Controlling invasive species and preventing their introduction in the first place, can save taxpayers and marine-based businesses hundreds of millions of dollars each year. Although prevention of introductions in some cases requires the enactment and enforcement of laws and regulations, individuals and private organizations can make a difference as well. This web site identifies species of concern, and the pathways by which they are introduced to the Northeast U.S. (Maine to New York City). For each pathway of introduction we provide solutions and resources. Our top 10 list of ways to prevent introductions of new species [link to top 10 list] is a quick reference guide for all of us who have contact with coastal waters. This site also describes how you can get involved in volunteer monitoring of marine introduced species. Our Marine Invader Tracker Information System allows citizen scientists to contribute data by following a simple recommended procedure and survey protocol. The site is educational and users are welcome to download materials for educational and non-commercial purposes. Please acknowledge the Northeast Sea Grant Programs if you use templates for flyers, brochures and other materials, and let us know when you do this by emailing Judy Pederson. This site represents a collaborative effort of the Northeast Sea Grant College Programs (listed below), and is funded by the National Sea Grant College Program (NOAA). Sea Grant College Programs support research and educational initiatives to promote the wise stewardship of our oceans as well as the development of marine technologies.